Chamilandu camp offers a comfortable retreat in one of the Luangwa Valley's prime remote river locations. A series of 7 ox-bow lagoons attract a diversity of wildlife. The central area combines the lounge, dining room and bar, all with superb views over the Luangwa River. The accommodation is in the form of 3 'tree-houses', which blend modern and classic decor and offer views over the Luangwa River and the magnificent Nchindeni Hills. The rooms are made of grass and thatch and on raised decks. Each 'tree-house' is up on 2 metre stilts and is luxuriously furnished in a rustic style. Refurbished in 2016, the houses are decorated in soothing creams and pastel shades and feature wrought iron and brass fittings. All have a 4 poster bed. There is a large deck area with lounger and 180 degree views across the river and beyond. The rooms have stylish outdoor bathroom facilities with a shower and hot and cold running water. The camp offers both morning and evening walks and combinations of day and night game drives, all led by enthusiastic expert guides. 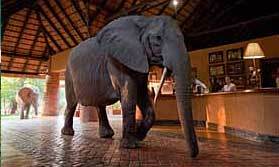 After a dawn walk, guests can enjoy a hearty brunch then relax before a late afternoon game drive. There's also a hide overlooking one of thew lagoons near the camp, where you sit and watch animals by and in the water as you relax over lunch and a drink. These are all excellent ways to observe the wildlife and get a feel for the area. They have a solar-cooker project, a solar freezer, a worm farm for compost, they employ locally, support Luangwa conservation......they are one of the good guys. "Stunning Camp! This is one of my favourite bushcamps in this region. It has the back-to-basics feel but in a very luxury way. The view from the bed is outstanding, and with only 3 rooms you do get the feeling of being the only people for miles around, just surrounded by wildlife which is perfect!" "Chamilandu was an incredible experience - living in the African bush with 11 interesting and talented staff. Best food we had in Zambia by some margin."